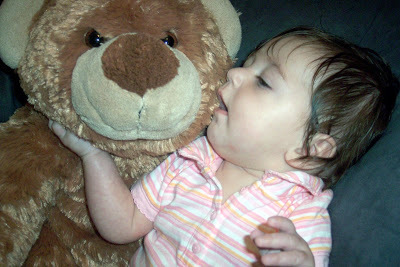 Cate puts lots of things in her mouth right now, including this stuffed animal today. She’s 4 months old today. And she weighs 13 pounds 12.8 ounces and is 25 1/2 inches long. That puts her in the 55th percentile for weight and 99th percentile for height. And that means she’s grown 5 pounds and 12.9 ounces and 5 1/2 inches since she was born. I can’t believe she’s four months already! Where does it go?